Learn how children’s literature can help K–5 students see the real-life applications of mathematical concepts. This user-friendly book shows how to use stories to engage students in building critical reasoning, abstract thinking, and communication skills, all while helping students understand the relevance of math in their everyday lives. 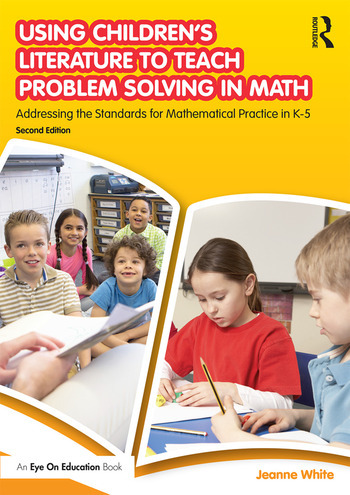 Each chapter is dedicated to one of the eight Standards for Mathematical Practice, and offers examples of children’s literature that can be used to help students develop that practice. The book offers activities for beginners as well as for more advanced problem solvers. Each chapter also provides guidance for ELLs and students with special needs, so no matter your classroom environment, you’ll be able to use these strategies to make math class more dynamic, engaging, and fun. What Does This Standard Mean for Grades K-2 Problem Solvers? What Does This Standard Mean for Grades 3-5 Problem Solvers? Each Orange Had 8 Slices-K.OA Count to answer, How many? Jeanne White has been an educator since 1992 when she began teaching elementary school in the south suburbs of Chicago. She is currently a Professor of Education at Elmhurst College.